Have you ever had a dream of becoming a mermaid? Do you want to experience the underwater world? 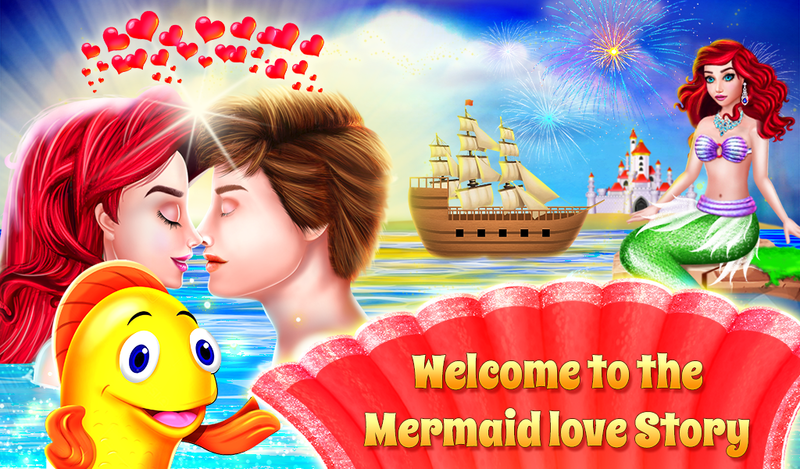 So Mermaid & Prince Love Story is the perfect game to explore the deep oceans. 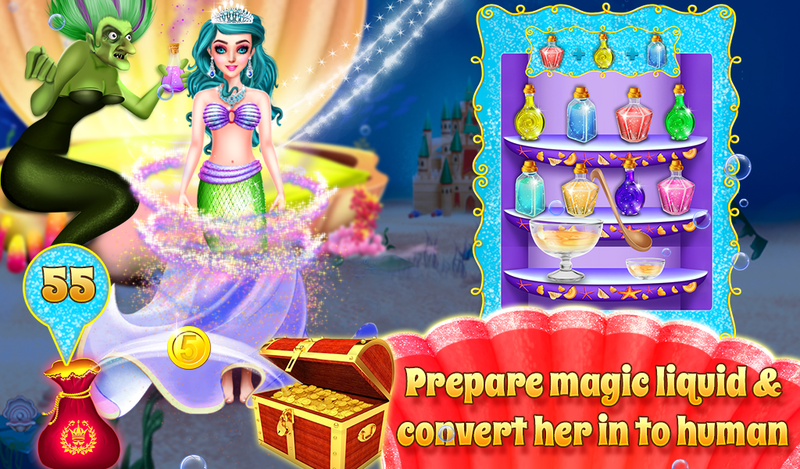 Play as a cute mermaid princess & enjoy the marine life from the shoes of this enchanting mysterious creature. 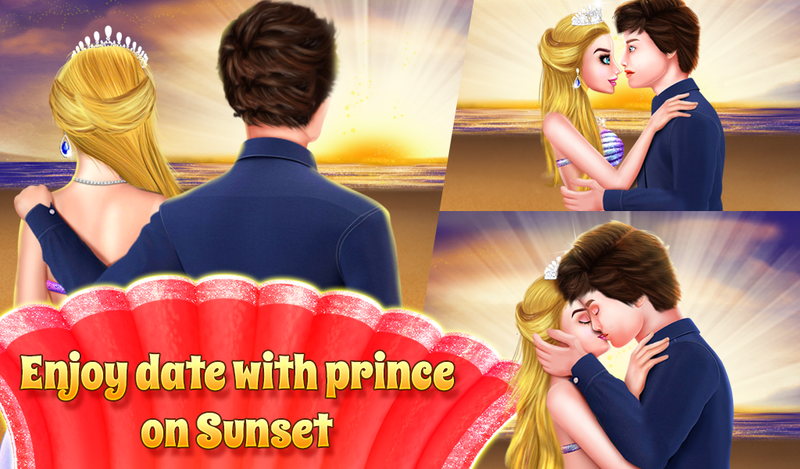 You are going to love this Prince love affair story in this Mermaid Kingdom Game. 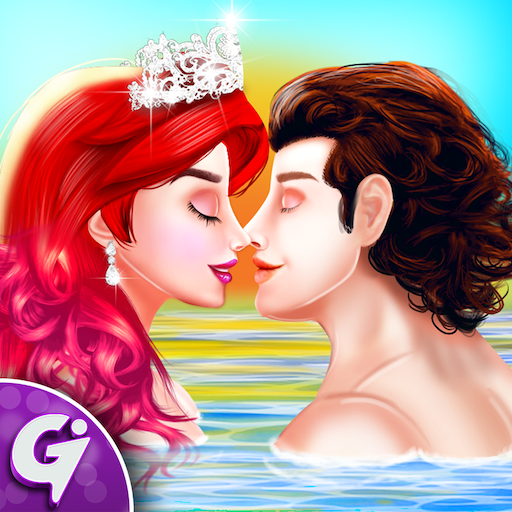 In this Mermaid love story game you can enjoy mermaid romance, underwater kissing, love, crush in water, mermaid love games & many more. Olivia our sea princess is turning 18 & there is a celebration of her 18th birthday. She asks for her birthday gift from his father. 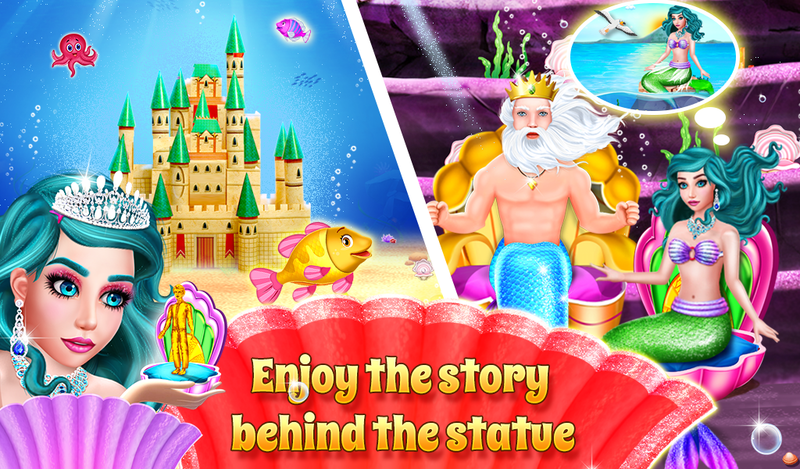 There is also a story behind the statue in this mermaid game, so find it out by playing this Mermaid Princess Game. In here, we need to help mermaid to reach her destination. 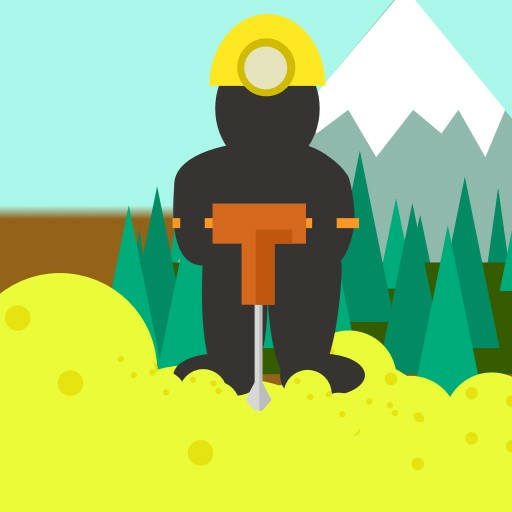 Collect as many coins as possible within the limited time period. After reaching to her destination that is a surface of the ocean, she found it mesmerizing. She saw his dream man sailing on a ship, she couldn't believe her eyes. Unfortunately, ship started sinking, find out what happens to her Prince. 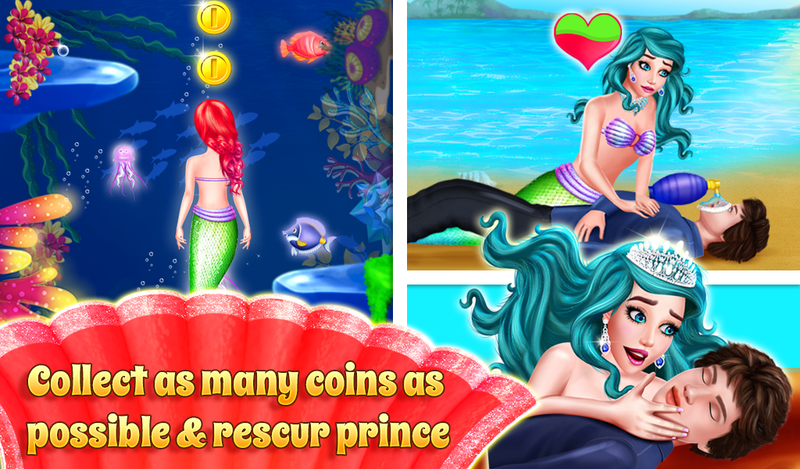 In mermaid rescue story game, you can help mermaid to save her Prince. After that bring him back to the surface to save his life. Princess Olivia is in love, but she was confused whether the prince is in love with him or not, in order to figure that out she plays a beautiful Flower love game. Have great spa treatment experience with Olivia. Start it by washing the face with the help of soap & shower, apply the mask wash it & wipe it. Remove pimples, do threading & make the face look spotless. A meeting with Prince is incomplete without makeup! Choose hairstyles to match your fashion, apply eye shadow, eye lenses, blush & lipstick to make the outfit complete. It's going to be fun to do mermaid makeup. 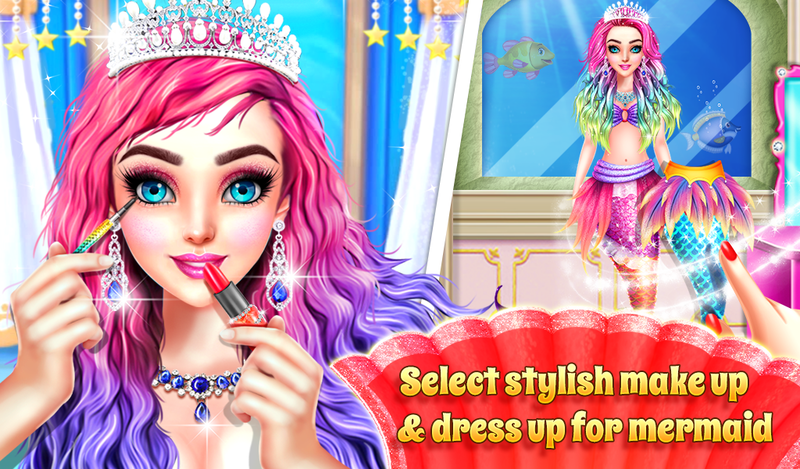 Choose a dress for a mermaid, select a hairstyle suitable for this meeting, jewelry like necklace, earrings. Prince & Princess are fell in love & they realize that they can't stay together as Olivia is a mermaid. 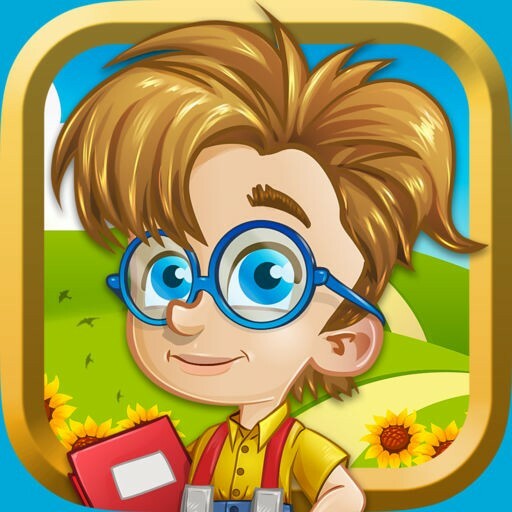 Play it to know more & enjoy the kiss. Olivia shared her problem with her sister & gave her solution to go to the witch. Olivia went to a witch for the solution of her problem. She was ready to pay a price to become a human, so that she could spend her life with Prince. Witch prepare a magical liquid & covert her into human. Olivia was happy & couldn't wait to meet his Prince. Prince had already arranged a picnic for her, he was extremely happy to see her transformation into human & love is in the air so make them kiss in this love game. She is getting married to her dream man. So help her for spa treatment, choose Shampoo to wash her Hair, remove pimples, shape up the eyebrows then choose soap to wash face. Next is the princess makeup session so select a hairstyle, blush, eye lenses, lipstick, ornaments & much more. 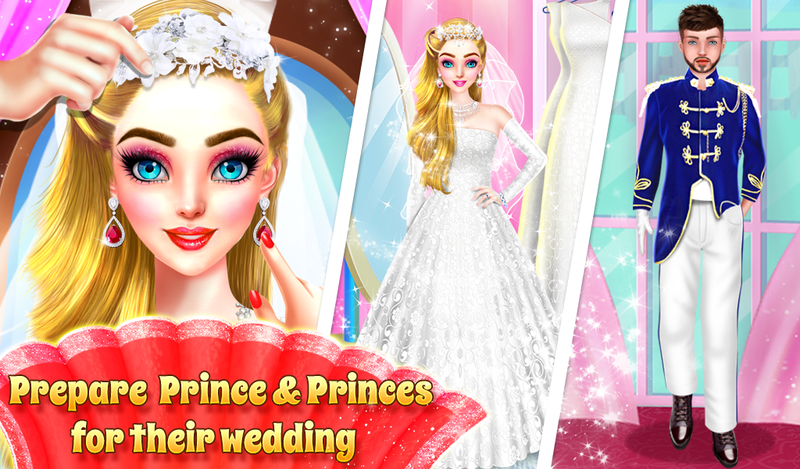 Select wedding dress, necklace, crown, bouquet, gloves, footwear & much more in this dress up game. Prince is confused what to wear, so help him to choose a dress for his special day. A wedding is happening in the Castle. So decorating the venue by choosing the carpet, entrance, flower bouquet. It's important day for both Bride & groom. Here, they will get married & make promises to each other. Choose the ring of bride & groom. Wedding photography is important because it will capture your day, it will tell a story of your day.